Looky, looky, it’s done! 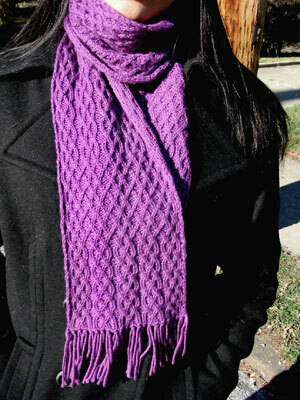 I was a little uncertain about the design as I was knitting it, but I do love the finished product. It looks great either under or over a wool pea coat. The finished fabric has a nice, flowy drape, but is still nice and warm. This one’s a winner. The only thing I would do differently is to pick a different yarn, actually. And maybe do a different edge treatment. But the main thing is the yarn. I discovered much too late in the process that Gedifra Cashmerino is 30% acrylic and thus it doesn’t have as much memory as I would like. I foresee frequent washings and blockings for both this and the Shedir hat to keep them shaped the way I want. I may try steaming next time to see if it makes a difference. And did I mention that I’ve posted the pattern for free? Do tell me how it reads. I spent a long time debating over whether I wanted to put the whole scarf on one chart so you could see how the different sections flow together, or if it was better to chart the sections separately, or if it made absolutely no difference as long as the written instructions were clear. Hope you like it! 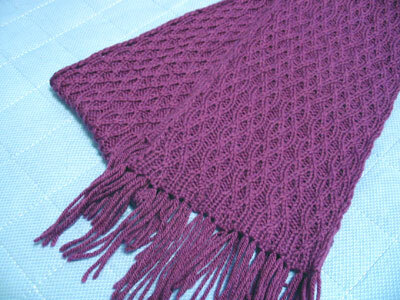 CogKnition posted this on December 10th, 2006 @ 11:57pm in Finished Objects, Knitwear Design, Scarves & Wraps, Site Updates | Permalink to "Achernar"
Beautiful!! Great partner for Shedir, and just lovely on its own — it looks warm and it’s extremely compelling. Great job! I’m looking forward to working this one up (in a few months!). It looks lovely in that color. I just treated myself to some silvery cashmere. I think I’ve found a new pattern! I’m loving the scarf! Thanks so much! I’m wondering how long yours turned out. I was thinking of knitting the Gedifra Pellissmo and Cashmerino yarns vest http://www.royalyarns.com/ptrn/GDF/GD-BK42/GH42-m621.html or the Pellissmo and Donatella yarn cardigan http://www.royalyarns.com/ptrn/GDF/GD-BK42/GH42-m607.html in the hairy mink color (brownish) in the Highlights 42 Gedifra Pattern Book. The Donatella Yarn is discontinued so I was wondering if I might try knitting with Cascade 220 with double strands instead of the Donastella. Do you know of any other yarns I might be able to replace the Gedifra Donatell with? I will need Black because my Pellissmo is a black and white hairy yarn.